LucED is an open source text editor with a graphical X11 user interface. Although the project has not published any official releases so far, you are welcome to play around with the current source code. 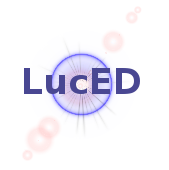 LucED - The Lucid Editor - is copyrighted by Oliver Schmidt and is licensed under the terms of the GNU General Public License Version 2 (see the files editor/COPYRIGHT and editor/LICENSE). Lua - a powerful, fast, lightweight, embeddable scripting language - is copyrighted by Lua.org, PUC-Rio and is licensed under the terms of the MIT License (see the file lua/COPYRIGHT). PCRE - Perl Compatible Regular Expressions - is copyrighted by the University of Cambridge and is licensed under the terms of the BSD Licence (see the file pcre/LICENCE). LPeg - Parsing Expression Grammars For Lua - is copyrighted by Lua.org, PUC-Rio and is licensed under the terms of the MIT License (see the file lpeg/LICENCE). lposix - a POSIX library for Lua - has been placed in the public domain by its author (see the file lposix/LICENCE). Official LucED releases are distributed as tar.gz archives, based on the widely used GNU autotools build system. The tar.gz archive should not be used for development purposes, because it contains generated C++ code. For development purposes a checked out git repository should be used (see section Building in a development sandbox). --disable-xpm disables the usage of libxpm for displaying icons. This can improve performance on slow connections. --disable-iconv disables the usage of libiconv for transforming character encodings. If libiconv is disabled, LucED only knows UTF-8 and ISO-8859-1 encoding. --enable-debug enables various runtime checks for debugging purposes. This can slow down performance but makes it easier to track errors, since a detected programming error will abort the program immediately. --prefix=PREFIX is a generic configure option to determine, where the files are to be installed (default for PREFIX is: /usr/local). The LucED program is then installed under PREFIX/bin/luced. to get a list of all commandline options that can be passed to the configure script. For development purposes, LucED should be build within a checked out Git repository. In this case the GNU autotools are only used for finding the system configuration with autoconf (and for building the release tar.gz archive), the build process itself is based on hand-written Makefiles. You can get the latest source code from the github repository. Local build adjustments can be done in the file sandbox.mk, to override settings of the Makefile. This tar ball should not be used for development purposes, because it contains generated C++ code. For development purposes a checked out git repository should be used. Compilation has been tested with gcc versions 3.4, 4.1, 4.2, 4.3, 4.4 and clang version 2.9 (clang version 2.8 compiles, but generates incorrect exception handling code). There may be problems with some C++ compilers, that do not fully support C++ templates. If you have any problems, please contact the author via email: oliver at luced dot de. For less typing, the author recommends to create a shell alias or a symbolic link to type lc instead of luced, e.g. LucED doesn't have a file selector, every file must be opened through the shell command line. To create a new file, simply invoke LucED with the desired name of the new file. If the current directory and the home directory both have no directory named .luced, a default .luced configuration directory is written on program invocation in the home directory. HOME to find out, where the default config directory .luced is to be found. LUCED_CONFIG_DIR to override the default config directory $HOME/.luced. LUCED_DEFAULT_ENCODING to override the system's default character encoding. LUCED_INSTANCE to invoke LucED with a specific instance name if no instance name is given as the commandline argument. -i, --instance to determine the LucED instance name. The following argument parameter must be the desired instance name. -ns, --no-server to start LucED as foreground process without considering or launching a background server process. -e, --encoding to determine the encoding for the next file name on the commandline. The following commandline argument must be the name of the desired encoding. -qs, --quit-server to shut down a running server instance from the commandline. -cdc, --clone-default-config to clone the built-in config package default in the LucED config directory. invokes LucED with instance name TEST, files test1.txt and test3.txt with default encoding and file test2.txt with Latin-1 character encoding. If no instance with name TEST exists, a background LucED server process with this instance name is started. If the named LucED server instance exists, the commandline arguments are passed to this instance. If a desired file is already loaded, the corresponding window is raised (the option -e is ignored in this case). this can be useful to edit or to examine the built-in config files of the default package.